Google Montana Snow Survey to find important information on Montana’s snow pack. The Jefferson River Basin in southwest Montana is at 95-120%, with more snow potential storms headed our way. They say a picture is worth a thousand words. This picture is our interpretation of the snow pack data. 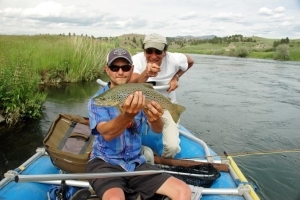 Healing Waters Lodge would love to be your fly fishing destination in 2016. Call (406) 684-5960 today and talk to Mike about your fly fishing options in southwest Montana or on the coveted Smith River.